ACMIT develops procedures and mechatronic systems on a micro- and macro-scale in order to increase efficiency and safety of medical treatment. Our particular focus is on Minimally Invasive Procedures, including laparoscopic/endoscopic surgery as well as needle-based and image-guided interventions. The activities are extended with sensor development for non-invasive wound monitoring and with micro-optics in ophthalmology. Topics like interfaces, interaction, usability, work-flow optimization and training support our research and development in a fully integrative way – from user to treatment. 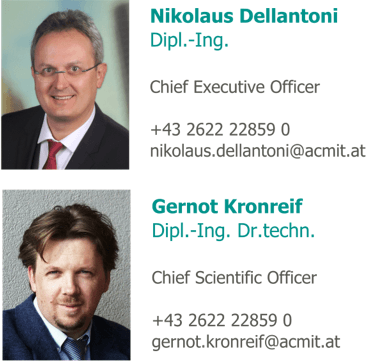 Research and development in ACMIT is fully application oriented, with the overall goal to bring developments to their real use in clinical context within reasonable time. New actuation principles for multi-functional surgical tools, advanced robotic components and interaction principles. Integration of developed components in selected applications, prototyping and clinical evaluation. Sensor technology for detection and verification of certain tissue properties. Sensor integration into wound dressing for monitoring of the healing process. Micro-optics for ophthalmology, including transfer of novel micro-optical technology into surgical tools. (i.e. data transfer) between workflow and particular sub-problems, like usability engineering, risk analysis, training concepts, and much more. Research in ACMIT is carefully designed to provide a clear clinical benefit for surgeons and patients. We pay attention on a smooth integration of new technology into the clinical workflow by development of suitable HW/SW interfaces to existing OR and by dedicated usability concepts. Finally, we take care of an ideal training for the users to facilitate handling of medical tools by development of training models and course setups.